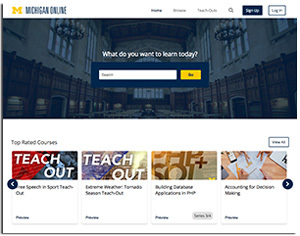 The University of Michigan's (U-M) Office of Academic Innovation has launched a new portal, Michigan Online, to bring all of the university's digital learning opportunities together in one place. The new site serves as gateway to more than 120 programs, including massive open online courses (MOOCs), certificates, teach-outs, specializations, Xseries courses, micromasters and more. Between them, programs now offered through Michigan online have nearly 7 million enrollments and are accessible in more than 190 countries. Users can search by subject, course length and type. "When the first MOOCs were launched, no one knew how they would evolve. And then the amazing U-M faculty embraced the opportunity to experiment with online courses that were aimed at learners from across the lifespan and across the globe. And those experiments continue to be successful," said James Hilton, U-M vice provost for academic innovation, in a prepared statement. "The launch of Michigan Online will make it easier for people on and off campus to navigate the rich and growing content that is Michigan." Joining edX in 2015 to offer more than 40 teachouts and MOOCs, including some courses designed to give students a start toward an on-campus degree. "Michigan Online further extends U-M's ability to provide high-quality learning opportunities for learners at all levels," said James DeVaney, U-M associate vice provost for academic innovation. "Michigan students will have even greater access to university expertise and resources, and learners around the world will discover new opportunities to acquire new skills, access global learning communities and explore new topics, at their own pace."